The food that comes from Carmen and my kitchen can only be described as internationally eclectic. One week we are turning out spicy Thai, another week it is French desserts, but for me I always find balance and joy with Mexican food. 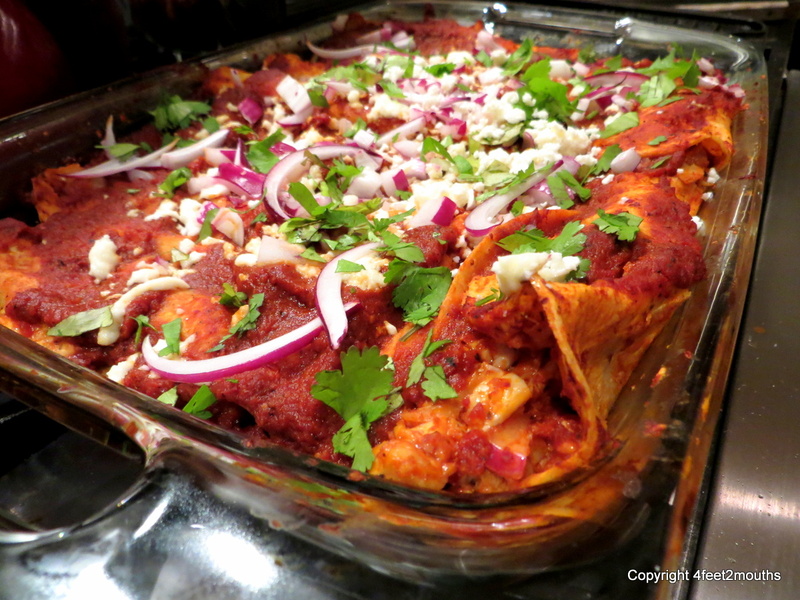 I originally tried this recipe from Rick Bayless’ Mexican Everyday, but I have adapted it over time by not straining the sauce, and adding queso fresco and onions to the enchiladas. This is my go to recipe for Sunday night when I know that there is a rough week ahead; and I need a stockpile of leftovers to get through it. It is challenging to make it as a small batch so plan on a few meals of the same delicious thing or invite several friends for a feast. Typically I make this recipe with leftover roast chicken, but I have made it numerous times vegetarian (see * below). 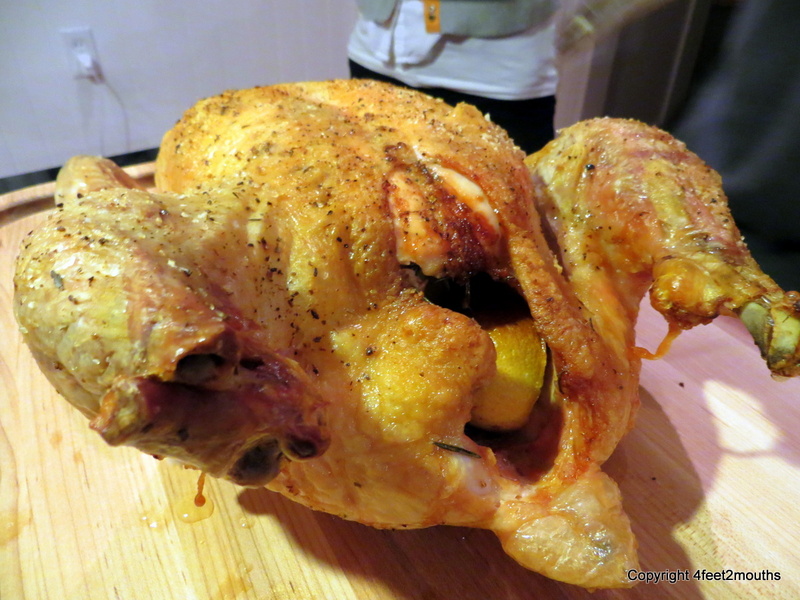 I’ll use an organic chicken that was roasted by me or my grocer the day before. We’ll consume some for the thighs and breasts on their own and use the rest of the meat for the enchiladas. Get full use of the chicken by making a stock from the bones, cartilage and slimy parts of skin. *In the vegetarian option I use strips of roasted yams and sweet potatoes that go wonderfully with the spicy sauce. 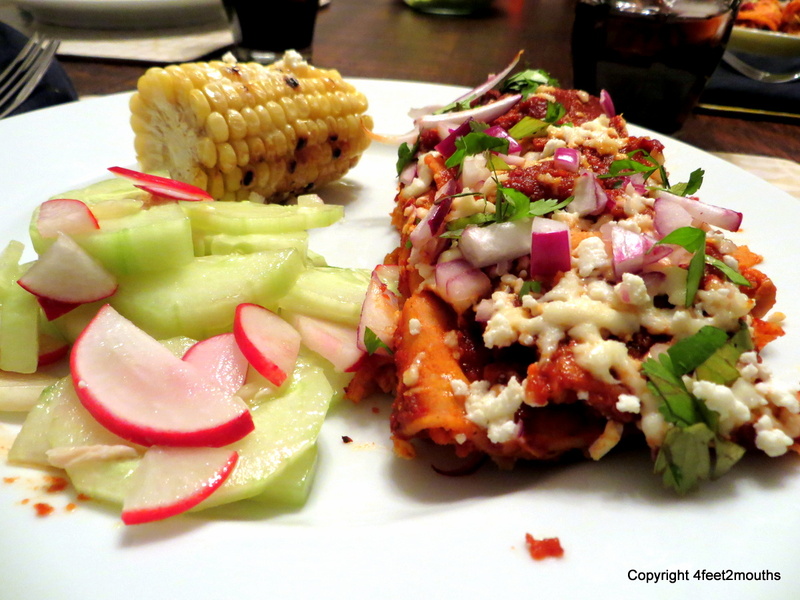 I have never had enchiladas better than these. The flavors are smoky, and slightly sweet with a spice and heat that keeps the fork in constant motion from plate to mouth. *One day ahead or two hours before dinner. Toss potatoes with olive oil, salt, pepper, rosemary and garlic. Roast on a baking sheet at 450°F (230°C) for 20 minutes, stir and flip potatoes and return for another 20minutes. Remove when slightly soft to bite, but not mushy. Let cool. 1) One hour and fifteen minutes ahead. 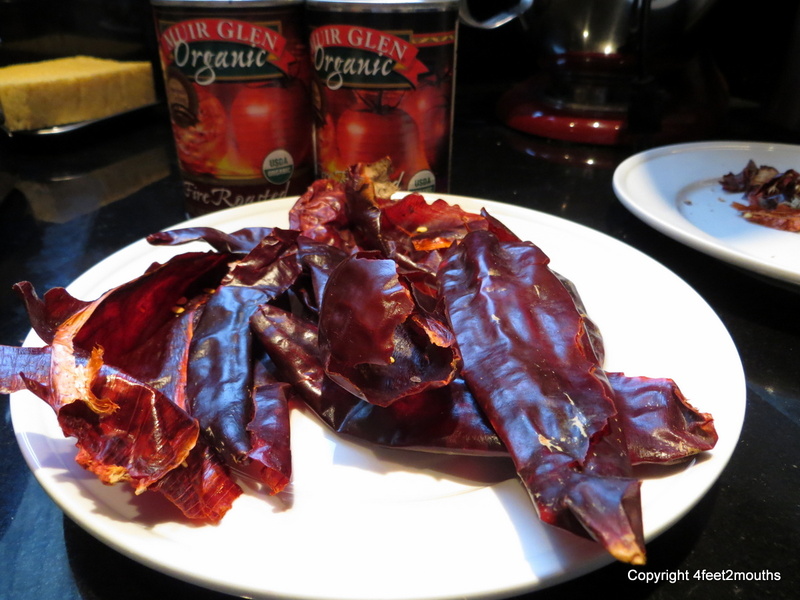 Prepare the guajillo chiles, open up and wipe the outsides with a damp paper towel. Heat a cast iron skillet (or normal frying pan) to medium heat and add a little olive oil to coat. Add the garlic and half of the peppers. 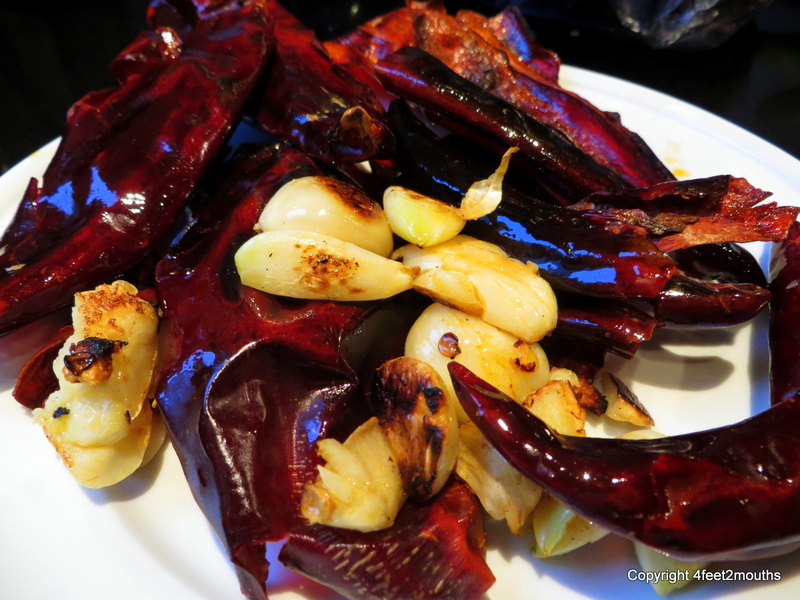 Press the chiles into the pan for 10-15 seconds each, then flip and cook the inside of the chile. The fumes usually become intoxicating so have the oven fan on and a plan to step away for a sneezing and coughing attack. Return to the pan and put the slightly browned peppers on a plate. Stir the garlic and cook the rest of the peppers. Cook both sides and cool the peppers and roasted garlic on a plate. 2) One hour ahead. Preheat the oven to 350°F (175°C). 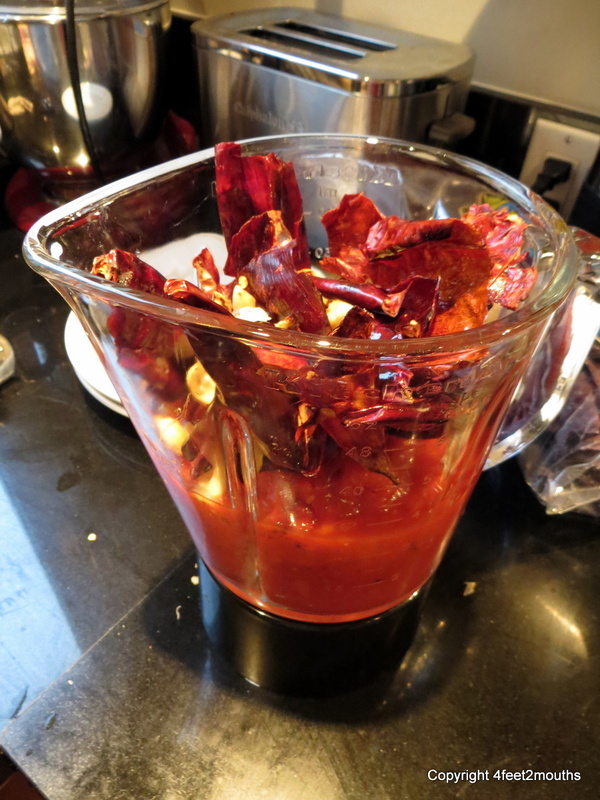 Add the can of tomatoes, roasted chiles, garlic and cumin to a blender or food processor. Puree for a minute to create a fine and smooth liquid. Pour the sauce into a large skillet at medium-low heat. Stir in 1 tsp salt and half of the broth. Cover with a splash guard and simmer for at least fifteen minutes. While the flavors meld together in the sauce it is time to prepare the filling. Pick all the useable pieces of meat and skin from the chicken carcass. The crispy chicken skin is essential to make these good, so don’t omit it. Pick through the meat one more time to remove any accidental bones or cartilage. Chop the meat into 1/4 inch chunks and place into a large bowl. 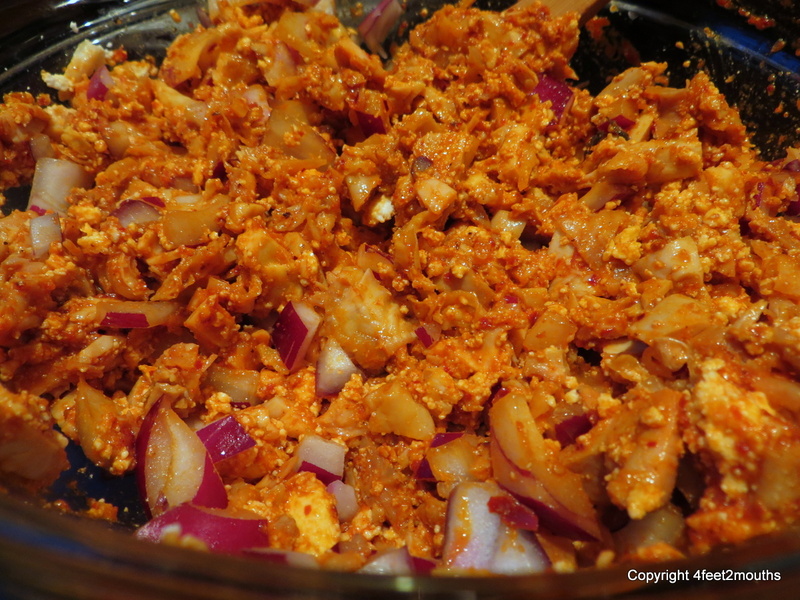 Mix in the chopped onion and grated cheese. Return to the sauce on the stove, stir and taste. Add sugar and salt to taste. The sugar will allow the sauce to better coat the tongue and bring the spice to all areas of the mouth. 1-2 tsp maximum, the sauce is not supposed to be sweet, just balanced. The consistency of the sauce should be that of half-and-half; a liquid with an obvious depth to it. Add more broth to thin or stir constantly over medium heat to thicken the sauce. 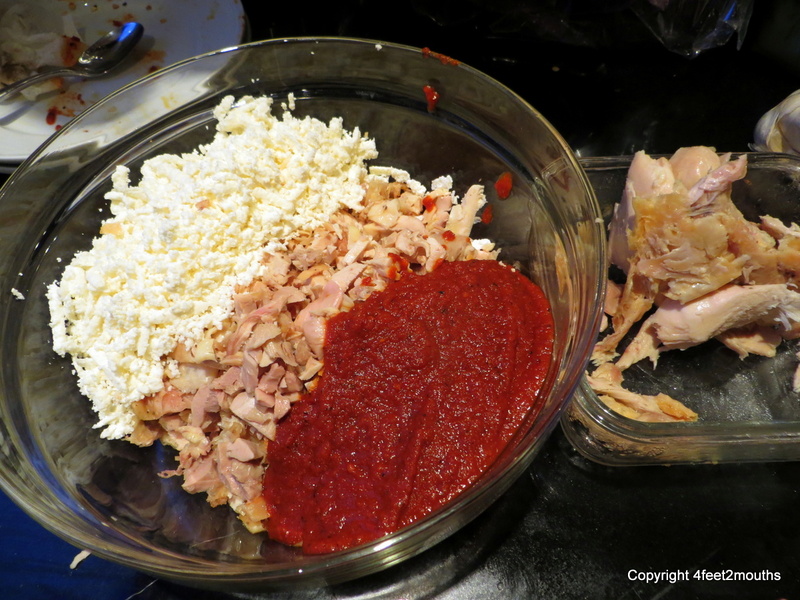 Scoop 1 cup of the sauce and mix into the chicken, onion and cheese mixture. Spread another 1/2 cup into the bottom of a 9×13 glass Pyrex dish. 3) 45 minutes ahead. 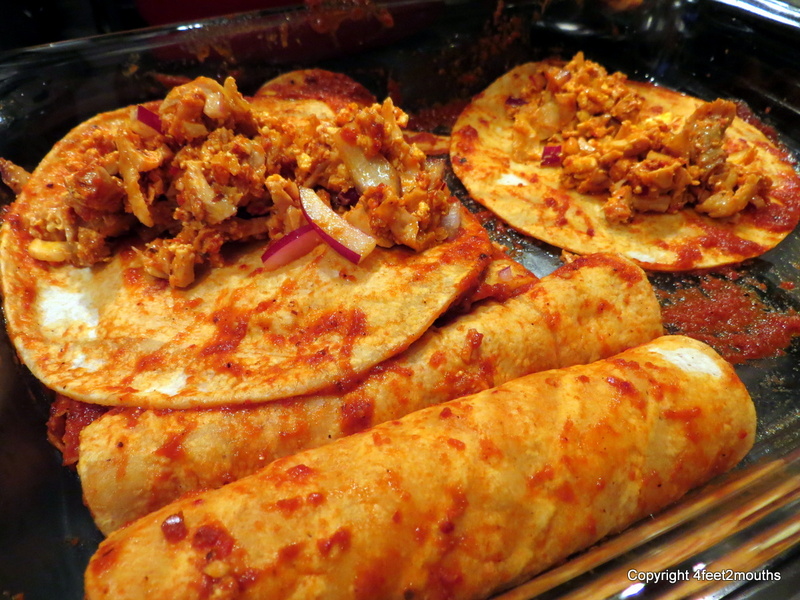 Heat 4-5 tortillas on a comal or griddle, flip and when pliable add the tortillas to the enchilada sauce. Coat the tortillas on both sides. Place 2-3 of the wet tortillas on the pirex dish. Spoon the filling mixture onto each tortilla. Roll tightly and fit into a row. 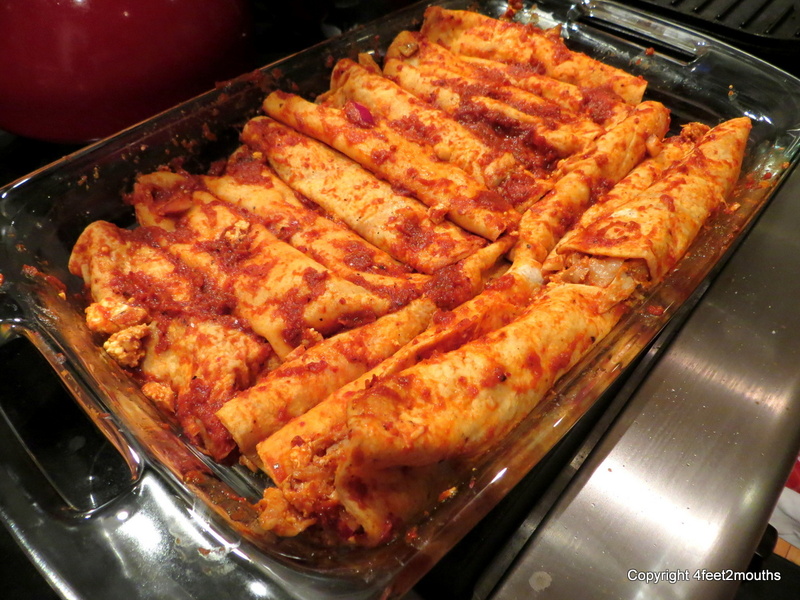 Repeat by adding additional tortillas to the comal, dunking the hot tortillas and assembling the rest of the enchiladas. Fill the entire pan and pour the remaining sauce over them. 4) Fifteen minutes ahead. Top with the garnishing cheese and onion slices. Bake for at least 10-15 minutes until heated through. 5) Serve. Remove from oven, top with chopped cilantro. 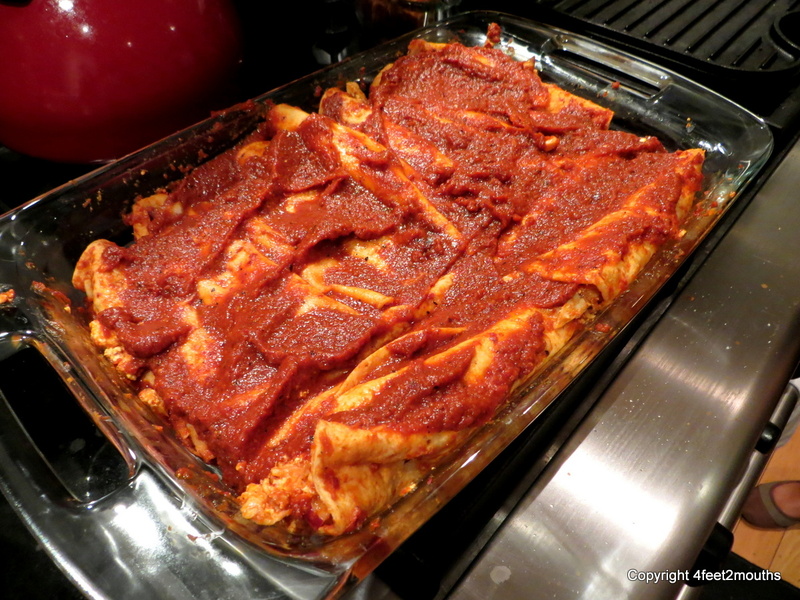 Place 2-3 enchiladas on a plate; sprinkle with a pinch more cheese. Mmmm.